Keywords: forage production, grassland farming, field forage production, plant breeding and seed production of forage crops, feed conservation and storage, grain forage. The results of studying spring triticale and field pea are presented for the single and mixed crops, the aim was to increase the protein full-value of the grain fodder and to reduce the product cost. It is found that the calculated fertilization rates for the planned yield of both spring triticale and field pea have the greatest effect on the seed mass per plant. Cultivating mixed crops of spring triticale and field pea is an economically efficient cultural practice; growing them as single crops without fertilization as well as under the application of the calculated doses of fertilizers has not provided the programmed crop productivity rate during the five years of research, resulting in decreased fodder units yield and lower profitability per 1 ha. At cultivating the mixed crops the optimal agrocenosis is that with the shares of spring triticale and field pea being 70 + 30 % of the seeding rate for the single crops. At this mixture ratio, the actual productivity of the grain fodder crops reached the programmed value. Keywords: grain fodder, mixed crops, triticale, field pea, yield programming. To assess the efficiency of different methods of improving low-yielding grasslands, field experiments were conducted on an old couch grass layland. 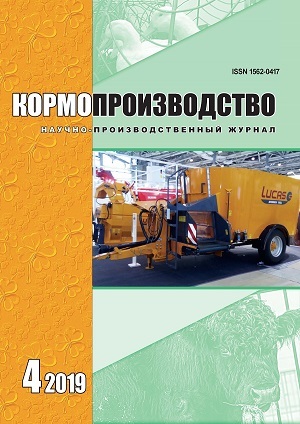 The design included variants of different tillage methods in combination with “Uragan Forte” and “Bazagran” herbicides application. The studied grassing methods comprised different agricultural machinery for soil tillage. Applying the herbicide “Uragan Forte” to kill the natural sod before soil tillage with different agricultural tools increased the exchange energy outcome and average annual yield of feed units. The highest yield was provided by legume-grass swards formed after mouldboard ploughing combined with rotary tillage or cultivation after destroying the natural herbage with the “Uragan Forte” herbicide. Direct seeding resulted in lower yields than sowing into tilled soil, and overgrassing of the couch grass layland sod was inefficient. Keywords: fallow lands, tillage, herbicides, productivity, economic efficiency. The outcome of developing the soybean cultivation technology for the forest-steppe zone of the West Zakamye is presented. Keywords: soybean, soil tillage, fertilization. The results of studying the efficiency of cultivating fodder crops are presented as for the single-species and mixed stands on various mineral nutrition ground in Bashkiria. Keywords: fodder crops, pure and mixed crops, energy efficiency. The data on the symbiotical apparatus’ formation and the productivity of broad beans is presented for the various application rates of the complex fertilizer diammophoska, the preparation “Master Special” and seed inoculation with ‘RhizoTorfin’ in the forest-steppe of the Central Chernozem zone. Keywords: broad beans, fertilization, productivity. The weeds in sainfoin crops are mainly represented by melliferous species. They are a source of pollen diversity in the agrocenosis, which in its turn greatly contribute to attracting the honeybees to sainfoin pollination. When organizing bee pollination of a crop it is necessary to create appropriate conditions improving the honeybees’ vital functions. It allows increasing seed yield up to 30%. When grown for fodder, sainfoin should be cut at the end of flowering phase. Thus it is possible to obtain not only good quality fodder, but also to let the bees use their capacity to collect nectar and pollen fuller. After 75-80% flowerlets in the sainfoin raceme cease blossoming, the pollinators leave the agrocenosis and switch to other melliferous plants. Keywords: sainfoin, crops’ weediness, honeybees, beekeeping. Increasing the efficacy of implementing the greening methods in arable farming is an important task of fodder production. Considering this, the development peculiarities of the yielding capacity, protein and energy productivity of awnless brome grass (Bromopsis inermis), alfalfa (Medicago sativa) and Hungarian sainfoin (Onobrychis arenaria) were studied in dependence with primary soil tillage and fertilization systems in the field crop rotations of the Volga region forest steppe. Alfalfa was the most high-yielding during the two years of use; sainfoin featured the least share of aftergrowth in the annual yield. Primary tillage and fertilization system make one-third of the variance in the productivity of perennial grasses and legumes. Mixed primary tillage system (disk plowing and ploughing) is more advisable than the minimized surface one (disk plowing and cultivation); alfalfa was found especially sensitive to the tillage depth. Fertilization background combination with the straw of the cereal forecrops was an advantage, particularly for the legume grasses. Protein efficiency is determined by a complex of hereditary characteristics of each particular species: it is higher in legumes than in gramineous grasses. The maximal amount of forage units, digestible protein and exchange energy was provided by alfalfa; sainfoin exceeded brome grass in these productivity properties. Keywords: perennial grasses, leguminous phytocenoses, tillage, fertilizers, productivity, protein efficiency. Being universal as crushing machinery, hammermills are used on many Russian farms for preparing forage grain to feed the animals, or for crushing the loose compounds in mixed feed production. They possess a number of unquestionable advantages such as small size, simple design, performance reliability, pounding efficiency and no considerable heating of the processed raw staff . However, increased wear, high energy intensity of the crushing process are typical for them along with a technological inconvenience of the necessary pause for changing the grinding coarseness. Several solutions for eliminating these demerits are suggested in the arti cle. Thus, using bulged towards the inner space sieve is provided in the hammermill construction for even distribution of the raw staff in the crushing chamber, and increasing the wear resistance of the separate active crushing members. Another improvement is a return line which provides a faster evacuation of the raw staff from the sieve inner space thus decreasing the energy costs. The crusher design developed by us has a spiral sieve and a segment one, allowing improving the milling efficiency because in this case a sieve is not just a controller but an influential factor increasing the impact speed of the hammers and the materials’ particles. The issue of the sieve mesh shape impact on the grinding quality was specially studied. As a result it was suggested to use two sieves with rectangular meshes — a moveable and a fixed one. At using the round-meshed sieves, the particles’ hitting impedes the normal evacuation of the processed mass from the crushing chamber. In the case of rectangular meshes the probability of the particles’ pathways intercrossing is lower, thus the hammermills’ performance is enhanced and the particle size distribution of the obtained product is improved. The option of shifting the moveable sieve against the fixed one allows adjusting the length of the clear area leaving the cross dimension constant, thus regulating the grinding coarseness. The suggested solution is already tested on a series-produced hammermill KDU-2,0 and is proved efficient: the power usage has decreased, the silt content was lower, and the obtained chop was more uniform. Keywords: hammermill, crushing, sieve, particle.